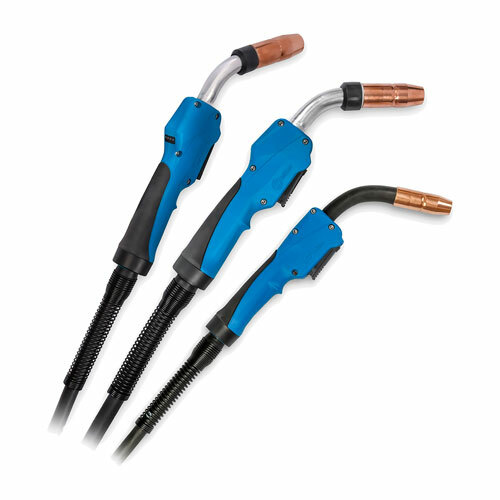 Miller Electric Manufacturing Co. introduced its MDX Series gas-metal-arc-welding (GMAW) guns, featuring an ergonomic handle with rubber overmolding for improved grip and a ball-and-socket handle swivel for reduced operator fatigue. Moreover, using the company’s AccuLock MDX and Bernard AccuLock S consumables, the guns’ front-loading liners lock in place (no need for set screws) and align concentrically with both the contact tip and power pin to optimize wire feeding. Error-proof liner trimming, with no measuring required, reduces burnbacks, bird-nesting and erratic arc caused by liners that are too short, minimizing downtime for troubleshooting or rework. Both AccuLock series feature tapered connections between the contact tip, gas diffuser and neck to maximize electrical conductivity, thus enabling longer product life. The MDX series of guns includes three models: MDX-100, MDX-250 and MDX-250 EZ. The front-loading liners lock in place? That's awesome. Miller Electric Manufacturing Co. has done a really great job with the specification of the guns.